Emys orbicularis have an oval or roundish carapace with only minimal flaring of the marginal scutes (males) which is jet black to yellow-green in color. It is littered with an array of small yellow or white spots, flecks and dots. Sometimes lines or rays form. The head is large, slightly pointed, yet sometimes blunt with a smooth appearance. The skin of the head is dark, often black with small yellow flecks or dots. The limbs are dark with yellow stripes or spots. The underside of the neck may or may not be flecked with an abundance of yellow. Emys orbicularis should only be housed indoors while they are young. A 20 gallon long aquarium will suffice for 1 to 3 hatchlings. A 40 gallon breeder is even better and Rubbermaid totes prove to be excellent enclosures as well. Once the turtles are at a less vulnerable size (0.1 meters (0.3 feet) SCL or more) they can be moved outdoors. We recommend an outdoor, in-ground pond. These turtles need both swimming room and walking room. Nesting females also require this large land area to search for an appropriate site for oviposition. A 9 x 9 meters (30 x 30 feet) pen with a 4.5 x 4.5 meters (15 x 15 feet) water area in it will suffice for a small group of adults (1.3 or 2.6). The walls of the pen must be secure to keep the turtles in. This means, they should be at least 0.45 meters (1.5 feet) high and dug into the ground by about 0.15 meters (0.5 feet). The walls can be made out of pressure treated wood, cement blocking, landscaping timbers and other fencing materials. These turtles can climb well so be sure to take appropriate measures in preventing escapes. The water area should be made of 45 to 65 mil fish friendly, pond liner and must be more than 0.45 meters (1.5 feet) deep. This is where the turtles will spend the winter so an adequate depth is crucial to avoid a solid freeze. Be sure to gradually slope the pond basin when digging it so that the turtles can easily get in and out of the water. The deepest part should be in the middle. A gravel or sandy area should also be provided for the females to lay their eggs. This area should have little cover. Logs, drift wood or planking can be added to the water area as basking platforms. Avoid using too many rocks because they can be abrasive to the turtles’ plastrons. Aquatic and land vegetation is an absolute must. Water hyacinth, water lettuce, lotus, various lilies, iris, cattails, frog bit and anacharis are all excellent choices for the pond itself. The turtles will greatly appreciate these items by hiding in them and searching for food. The land area can be planted with many different low lying shrubs, grasses and flowering plants. In the summer months, the turtles will leave the pond at times to hide under the foliage to escape the extreme heat and warming water. Indoors, I prefer to not use any substrate simply because without it, the enclosures are much easier to clean. I especially like to do this because I do not use filters. 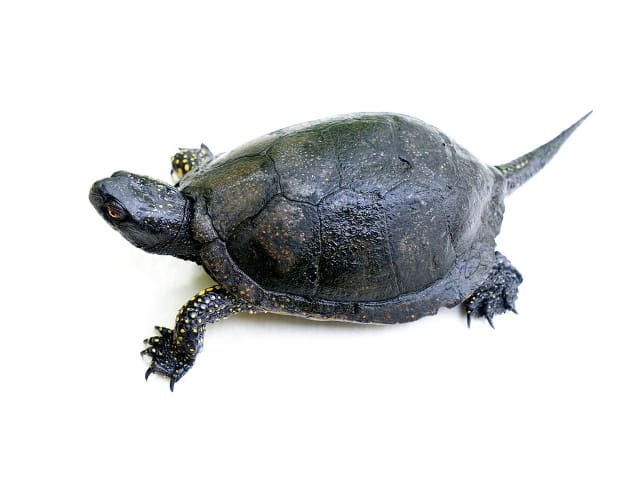 Instead, I choose to do frequent water changes with European pond turtles. If you would like to use a substrate, pea gravel is a good option. Outdoors, the pond area should have a 0.3-0.35 meters (1-1.15 feet) layer of peat and mud for the turtles to burrow into and for the plants to take root in. Allow leaves to collect in the pond during the fall because they will aid the turtles in hunkering down for hibernation. Natural sunlight is of course unbeatable and even baby European pond turtles should receive at least some outdoor time in predator protected units. However, there are several lighting options for keeping them inside. Mercury vapor bulbs, daylight spot bulbs, infrared bulbs and fluorescent tube lights are all available to keepers today. We prefer Mercury vapor bulbs which provide both UVA and UVB to the turtles. 100-150 watt bulbs over a dry basking area of drift wood or cork bark do the trick. We recommend 35-38 ºC (95-100 ºF) basking temp and 24-29 ºC (75-85 ºF) ambient room temperature. Aquarium heaters are not needed for this species and no additional heat source is necessary at night. The lights should be turned on in the morning and left on for 12 to 14 hours. It’s important to turn them off at night so that the turtles are exposed to a more natural, daily cycle like they would experience outdoors. This species does incredibly well in these outdoor situations and are capable of surviving even the coldest of winters. Some of our Emys will even move about under thick ice and come up for a breath of air randomly during the cold season. Filtration of the pond is optional. We prefer to use as many live plants as possible because they naturally filter the water. A peat based bottom is provided in which the plants are able to root in and grow. In combination with over flowing the pond bi-weekly, the plants help to keep the water in good condition. This species is incredibly aggressive at feeding time. They come off as complete “savages” when we offer food and we feed the following items: fish, shrimp, beef heart, beef liver, chicken gizzards and hearts, chicken breast, ground turkey meat, tadpoles, whole frogs, earthworms, superworms, wax worms, pinkies, whole skinned mice, commercial pellets, fresh pet wet dog food, snails and slugs. They are also capable of stripping a chicken bone clean of any meat, cartilage or skin. In the summer, we will throw raw chicken legs, thighs and wings to our pond turtles only to find the bones and nothing else afterwards. They can certainly become obese so be careful not to over-feed. Due to their skittish nature, handling isn’t recommended for this species. However, handling will be necessary to conduct periodic health checks. Hands should be clean before handling and washed after handling them and their environment. We clean the indoor Rubbermaid enclosures whenever the water gets dirty and we replace the water since we don’t use filtration. For outdoors we prefer to create a natural pond as mentioned above where the plants keep the water clean. Upper respiratory infections can occur especially during transit and is common during exportation of this species. Shell rot commonly seen on the plastron occurs as well.